Best known for political cartoons and humorous caricatures satirizing contemporary life, Daumier's paintings reveal a more serious examination of the human condition. The itinerant street musicians and acrobats in Wandering Saltimbanques are depicted without ridicule, the artist sympathetically revealing the poverty and isolation of their offstage lives. Daumier may have felt a personal affinity with the entertainers. 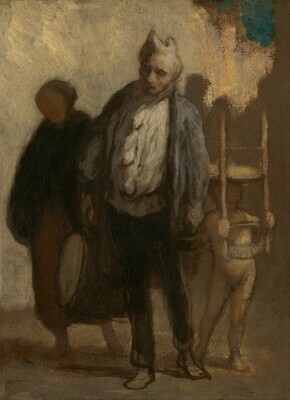 The little boy carrying a chair could be a recollection of Daumier's childhood, when his family, destitute and living in Paris, endured numerous displacements to progressively worse lodgings. Further, it has been suggested that the older clown clad in traditional costume and leading his family in this painting may be associated with the artist's father, a failed poet and playwright committed to the insane asylum at Charenton in 1851, where he died. Daumier was self-taught as a painter, and his style has many characteristics of the graphic media in which he trained. The blunt silhouettes of the figures and the simplified space they occupy are stylistic elements that originated in his lithographs. The unspecific, indefinite appearance thus produced endows them with more universal meaning. Personal associations aside, the saltimbanques here are artists struggling to make their way in a world that, as Daumier depicts it, is a bleak, anonymous place. Alexis Rouart [1855-1911], Paris, by 1901; probably by inheritance to his father, Henri Rouart [1833-1912], Paris; (Galerie Étienne Bignou, Paris and New York); sold July 1933 to Chester Dale [1883-1962], New York; bequest 1963 to NGA. Lent by Alexis Rouart to the 1901 Exposition Daumier at the l'Ecole des Beaux-Arts, Paris. On the back of the painting is a red wax seal that reads "Alexis Rouart." Exposition des peintures et dessins de H. Daumier, Galeries Durand-Ruel, Paris, 1878, no. 79, as Paillasse. The Chester Dale Bequest, National Gallery of Art, Washington, D.C., 1965, unnumbered checklist. Picasso: The Saltimbanques, National Gallery of Art, Washington, D.C., 1980, no. 6, fig. 5. Manet and Modern Paris, National Gallery of Art, Washington, D.C., 1982-1983, no. 70, repro. Klossowski, Erich. Honoré Daumier. Munich, 1908: 15, no. 205, pl. 52. Klossowski, Erich. Honoré Daumier. Munich, 1923: 104, no. 205, repro. 87. Fuchs, Eduard. Der Maler Daumier. New York, 1927: 50, no. 123a (Munich, 1930: 50, no. 123a). Eighteenth and Nineteenth Century Paintings & Sculpture of the French School in the Chester Dale Collection, National Gallery of Art, Washington, 1965: 42, repro. Summary Catalogue of European Paintings and Sculpture. National Gallery of Art, Washington, 1965: 37. European Paintings and Sculpture, Illustrations. National Gallery of Art, Washington, 1968: 30, repro. Maison, K.E. Honoré Daumier, catalogue raisonné. 2 vols. New York, 1968: I:65, no. 25, pl. 120. Starobinski. Portrait de l'artiste en saltimbanque. Geneva, 1970: 80, repro. Mandel, Gabriele. L'opera pittorica completa di Daumier. Milan, 1971: no. 31, pl. X.
Clark, Timothy. The Absolute Bourgeois. London, 1973: 119. European Paintings: An Illustrated Summary Catalogue. National Gallery of Art, Washington, 1975: 92, repro. Harper, Paula Hays. Daumier's Clowns: Les Saltimbanques et Les Parades. New York, 1981: 101-107, pl. 30. Walker, John. National Gallery of Art, Washington. Rev. ed. New York, 1984: 437, no. 626, color repro. European Paintings: An Illustrated Catalogue. National Gallery of Art, Washington, 1985: 114, repro. Eitner, Lorenz. An Outline of 19th Century European Painting, from David through Cézanne. 2 vols. New York, 1987-1988: II:125, pl. 216. National Gallery of Art, Washington. National Gallery of Art, Washington, 1992: 184, repro. Ives, Colta, Margaret Stuffmann and Martin Sonnabend. Daumier Drawings. New York, 1993: 222, fig. 132. Eitner, Lorenz. French Paintings of the Nineteenth Century, Part I: Before Impressionism. The Collections of the National Gallery of Art Systematic Catalogue. Washington, D.C., 2000: 157-164, color repro. Hand, John Oliver. National Gallery of Art: Master Paintings from the Collection. Washington and New York, 2004: 353, no. 286, color repro.